Despite a mixed critical reception for the culturally offensive ‘Temple of Doom‘, audiences’ lapped up the experience of a third Indiana Jones movie. After a brief hiatus to focus on more serious fare in the form of The Colour Purple, Empire of the Sun and Always, a third instalment was always going to be an irresistible draw for Spielberg, Lucas and an audience hungry for more. Troubled by the response to the darker tone of the second instalment, there was a concerted effort to go back-to-basics, and, following a number of rewrites that would take our Fedora-adorned adventurer through haunted mansions, pygmies and monkey kings, they settled on a screenplay by Innerspace scribe Jeffrey Boam. For their third feature, Lucas had already decided on The Holy Grail as a replacement for the Ark of The Covenant, but it was Boam who suggested against making it the focal point of the entire movie. He believed that to conclude a successful trilogy in the right way, there had to be some form of closure, and making the relationship between Indiana and his father central to the film would allow them to achieve as much. By making this third instalment a family affair, Spielberg was able to create a truly magnificent opening sequence. Both Spielberg and Ford had been ‘Life Scouts’, and it seemed only natural that an adventurous archaeologist would gain some of his early life experience from such an establishment. By showing us a young Indiana, it allowed Spielberg to explore some of the characteristics that would eventually ‘make the man’. 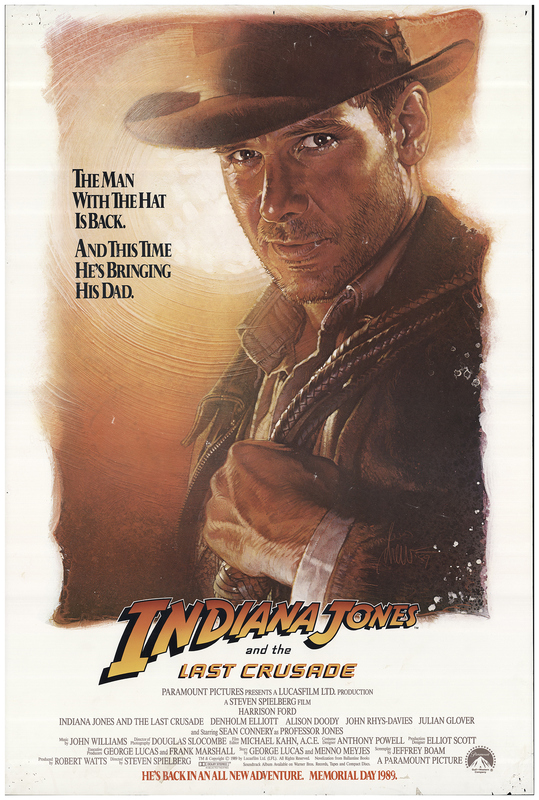 The sequence succinctly shows us how Indy obtained his scar, his fear of snakes, his whip and, most importantly for such an iconic character, his swagger, outfit and fedora. As an action sequence it is up there with anything else in the series, but as a vehicle for characterisation it is truly astounding, allowing us also a first glimpse of the boy’s disapproving father. Young Indy – It belongs to Coronado. Fedora – Coronado’s dead, and so are all of his grandchildren! 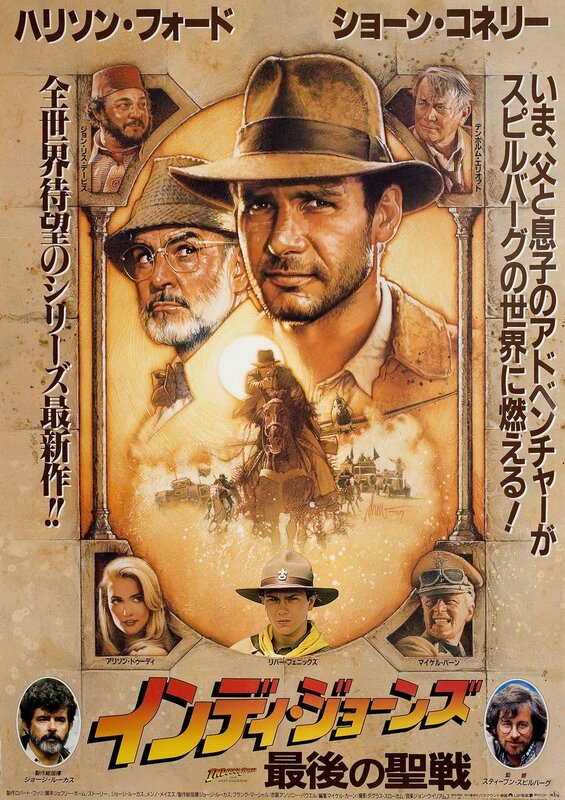 Young Indy – This should be in a museum! As an aside, you have to tip your Fedora to River Phoenix, who is remarkable in this opening scene, and perfectly believable as a young Indy. Ford reportedly persuaded Spielberg to give Phoenix the role having already worked with him on The Mosquito Coast, proclaiming that, from all those who had auditioned, he was the one who most resembled him as a kid, and it is easy to see why. Phoenix had the same mannerisms, and his delivery of lines such as “Everyone’s lost but me” conveyed the same charming arrogance that first endeared us to Ford. If it had not been for his untimely death, I wonder whether the temptation would have been there to bring Phoenix back for a feature-length ‘Young Indiana’ film. Tragically, this is something we will never know. Following the frantic opening of ‘The Last Crusade’, we are given the chance to draw breath as we move back into familiar ‘Raiders’ territory, discovering that someone close to Indiana is dangerously mixed up in the search for a powerful religious artifact, leading our hero on a quest to find both the man and the treasure, and preferably before the latter falls into the wrong hands. Far from breeding contempt, this familiarity is like putting on an old pair of slippers as Indiana and his new found lady friend, Dr Elsa Schnieder, go tomb-raiding for a lost clue to the whereabouts of the Grail. It is very shortly after that some of the original ‘haunted mansion’ ideas emerge, and we finally meet Henry Jones in the form of the magnificent Sean Connery (an interesting choice seeing as they originally envisaged Indiana Jones as James Bond without the gadgets). Retaining his Scottish accent, Connery is wonderful as Jones Sr., my favourite line being the ad-libbed revelation of how he knew Elsa was a Nazi – “She talks in her sleep” – backed up by Ford’s brilliantly shocked reaction! They wanted to introduce Jones Sr. as someone who is more than a match for Indy, and he wastes no time in putting him in his place early on, telling him off for shooting three Nazi’s with frustrated petulance as he insists on calling him Junior. “Look what you did!” he exclaims, as if chastising him for drawing on the wall with crayons. Drawing on personal experience, Spielberg has long been interested in the relationship between an estranged father and son, and has often explored such issues, either explicitly or implied, in movies such as Close Encounters, E.T. and Artificial Intelligence. It is interesting that the two are here brought together by another of Spielberg’s thematic interests, the Nazis, and there must have been some cathartic release in the Nazi shooting scene, which sees the movie’s hero obliterating his key concern whilst berating his father. The memorable scene where he is confronted by Hitler, only for him to sign his autograph on the very diary the Nazis are fighting tooth and nail to get hold of, is both funny and creepy. To see Hitler having what he wants in his grasp and letting it slip away will have been equally cathartic, and casts the leader of the Third Reich at the centre of a comic moment, making fun whilst still portraying him as an emotionless and terrifying individual. The oddities and complexities of the father-son relationship are put under the microscope further when the two finally get a chance to talk in the airship and neither of them can find the words, Henry unwilling, and Indy unable to put 30 years of repressed emotions into words. That scene is turned on its head a little later when Henry thinks his son has fallen to his death, only for Indy to appear by his side moments later, by which time his attention has once again turned to the Grail, his words left unsaid. We all have emotions that we are unable or unwilling to express, particularly in regards to family, so to see that examined on screen gives us two fully realised characters that we invest in completely, and ushers in the climax when Indy is forced to pass the three tests to obtain the Grail. 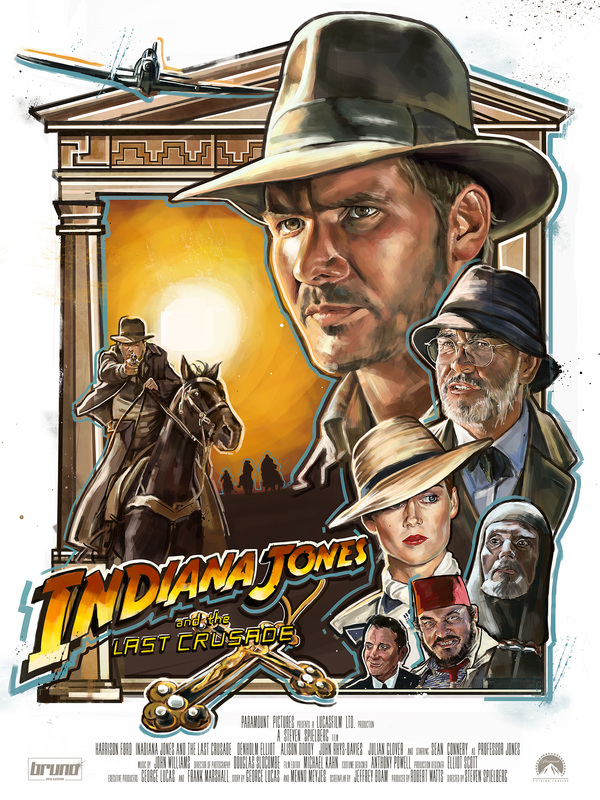 We know that Indy would do anything to prevent the Grail falling into the hands of the Nazis, and the easiest way to do that is to refuse to get it for them, but after Henry is shot with so much unresolved, the only thing that can save him is the Grail, the giver of everlasting life, and we’re firmly back in the kind of scary, religious territory that inspired the iconic melting head climax to ‘Raiders’, and once again Spielberg doesn’t shy away from the macabre. For one thing, there is the fairly graphic moment in which a severed head rolls down some stairs to land by two decapitated bodies, while an impressive special effects sequence sees duplicitous villain Donovan age a hundred years in a matter of seconds. 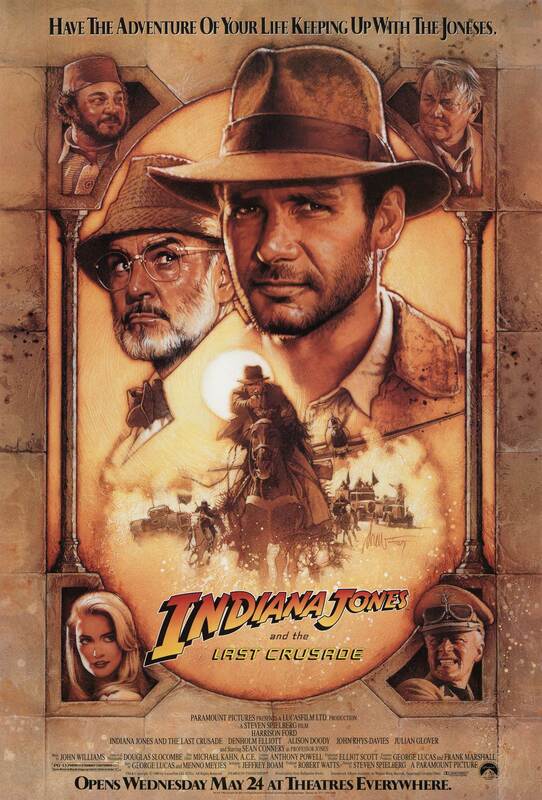 Indy’s successful negotiations for the Grail contrast with an opening of sheer action, and the rebellious, swashbuckling heroism that gets our hero through. Here it is the wisdom of age that wins the race, and so concludes the journey of a young boy with a lot to learn, who then grows to be a man, finally gaining the respect and admiration of a hard-to-please father, who himself finally realises that what really matters is his son. “Indiana… let it go”, he says as the Grail is swallowed up by the earth, perhaps learning from his own stubborn ways. In true Indy fashion, the original trilogy would end on a lighter note, with the revelation that it was in fact the family dog who was named Indiana, and that our hero’s name is in fact Henry. I’ve always related this to a moment in ‘Raiders’ when Marion says “See you later… Indiana Jones” with an intonation that puts his name in quotation marks, mocking him over his assumed identity. It all makes for a genuinely touching and emotionally satisfying conclusion. And so ends our journey with one of the great iconic characters of the VHS era. So many of us lived and breathed those movies throughout our childhood, running away from boulders, cracking imaginary whips and reciting the endlessly quotable dialogue in the school playground. With only one TV in the house and with VHS as the only equivalent to ‘on demand’, it was our imaginations that we invariably turned to, acting out events with our friends or in our heads as fantasy, something that the multi-channel, on-demand kids of today have been sadly deprived of. Of course, it helped that what we have here are three near-perfect films made by adults who are kids at heart, something we and generations to come will inevitably pass on to our own children. I think that perhaps Indy’s nemesis Belloq said it best… “We are simply passing through history but this…this IS history”. Author of The Horror Video blog, I enjoy seeking out new films from the darker side of cinema with a particular passion for reminiscing and revisiting fright flicks from the VHS era. A big fan of the films of Dario Argento, John Carpenter and Wes Craven as well as the more recent creations from the brilliant Guillermo del Toro and James Wan. You can't go wrong with a bit of 70s and 80s horror and if Bruce Campbell's in it then so much the better! A big fan of the stories and work of Clive Barker and HP Lovecraft, I am also an avid reader of short horror stories and novels that delve into the metaphysical. If we're talking about dislikes then I'm always willing to give things a try but my heart sinks when I hear of another 80s classic 'rebooted' for today's mass audience - originality goes a long way and should be respected. I love this installment of Raiders, Simon. Very well written assessment of this classic film. I didn’t know the reason behind why Phoenix was cast but I did know about him playing Ford’s son in the Mosquito Coast. The chemistry between Connery and Ford was very believable. Thanks Susan, very much appreciated…I’d not seen it for years before watching it ahead of this review, I’d forgotten how exciting it was and refreshing to see a different kind of relationship for Indy.